Many Jayco models are equipped with satellite connections. These can be a little confusing to say the least, and some don't have adequate instructions on how to operate it. Here's a short, hopefully easy to follow guide how this works. Good visual reference guide (link), I know the subject comes up often. I am installing a Winegard Trav'ler on my Precept 31UL. It is prewired on the roof top with coax and the 6 wire control cable. The coax is terminated in the compartment above the passenger seat BUT I cannot find the 6 wire control cable for the Trav'ler control box inside the coach. Any idea where it is located? I've got a question. It is kind of covered in the PDF link in the first post in this thread, but not exactly. The Dish 211k receiver has both HDMI and RF 75 ohm coax outputs. Will it send the signal to both of those outputs at the same time? Can I watch the main living room TV on the HDMI ouput and the bedroom and basement TVs on the coax output all at the same time? I understand they would all be watching the same program. 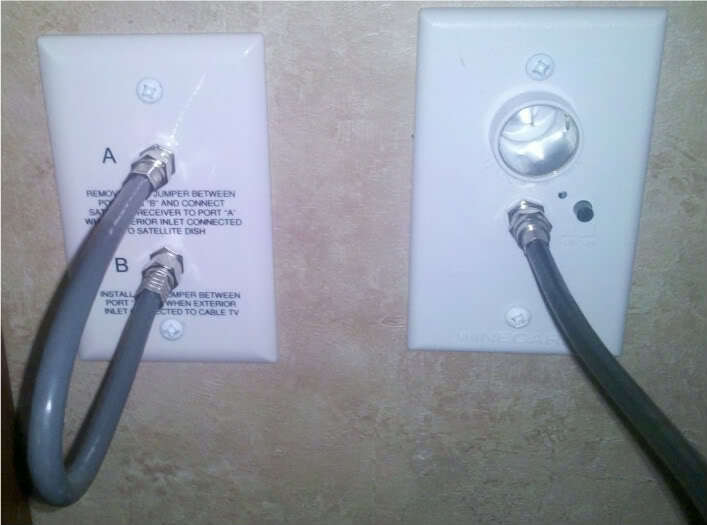 I called Jayco this morning, and they emailed a PDF of my camper's TV wiring schematic. I am attaching that to this post. I left out any model specific information for the satellite receivers since they are all different. The 211K has RF out, but the 211Z does not. Yes, that is what I discovered yesterday.